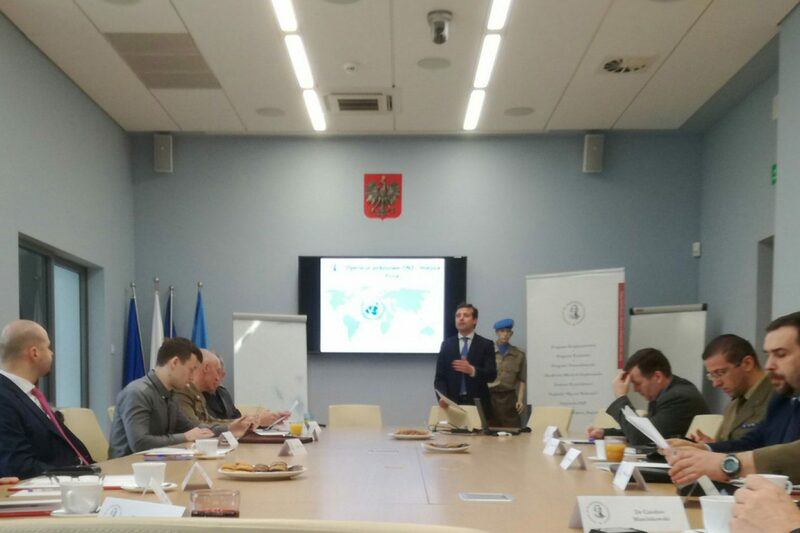 On March 30th in the Center for Foreign Mission Veterans took place expert seminar ‘Poland in UN peacekeeping missions’ organized by the Casimir Pulaski Foundation. The meeting was an extension of the formula proposed during the discussion about Polish Armed Forces in peacekeeping missions from November 22nd 2016 (link), as well as an event inaugurating the new cycle of Foundation’s Peace and Stabilization Programme entitled ‘Polish involvement in peacekeeping missions and stabilizing actions across the world’, which includes a complex overview of Polish involvement in peacekeeping missions of different international organizations (UN, EU, NATO, OSCE), and their impact on Polish developmental policy together with perspectives for international cooperation. The cycle will be summed up in a series of publications. The seminar was the first joint project of Pulaski Foundation and Veteran’s Centre. The meeting was opened by CEOs of both institutions – Zbigniew Pisarski and Col. Leszek Stępień. During the official part the CEO of Pulaski Foundation laid flowers under the Memorial Honoring Polish Peacekeepers commemorating Polish soldiers fallen in missions and operations abroad. Practitioners took part in the substantive part of the meeting – participants of UN peacekeeping missions and processes of organizing them, former diplomats, representatives of public administration (Department of Security Policy of Ministry of Foreign Affairs, Department of Military Foreign Affairs of Ministry of National Defense), military experts from War Studies University and Police Academy in Szczytno, representatives of academy (University of Warsaw, Wszechnica Polska University, Józef Piłsudski University of Physical Education) and experts connected to Pulaski Foundation. The seminar was led by Marcin Bużański, the director of the peace and stabilization programme. In round-table participants discussed actual state and global trends for UN missions, ‘lessons learned’ from UN missions, conceptions of Polish engagement, and non-military aspects of missions – in the context of potential, chances and threats for Polish involvement in missions. Effects of announced cuts on UN financing made by the US were also pointed out. The subject of discussion was the holistic approach to peace operations, need of consequent strategic approach, and deeper incorporation of organizational priorities to aid populations of countries consumed by conflicts. Participants pointed out the incompatibility of UN mechanisms to today’s world’s challenges, especially the inability to quick responding, and frequent incompatibility of military abilities in missions and tasks they face. In seminar participant’s estimation for Poland to successfully take part in mission and also for the future of missions all over the world, it is needed to expand civil involvement, deeper cooperation of different sectors, and broad mobilization of experts. New technologies as the key element of economic cooperation between Poland and Ukraine. Signing of the “Memorandum of Cooperation” during “Industrial Defence & Energy Summit. Europe meets Ukraine 2017”.